Nope I have two sisters and an english bulldog who is also female. Just saying hello from Amber, Cedric and Ros. Hope things are ok for you and your furry friends. Have not been online for awhile. Oh my gosh what cute pugs you have! Here is my email adds. puglover.my@gmail.com or live.com ..
Salmon fish oil are very good for pug's skin & coat. I feed my two pugs every day 1 fish oil and i ask my friend help me to buy from Aus and is really cheap there. Is Thomson brand salmon fih oil. If u got friend go to Aus maybe u can ask your friend help u to get there and in the same time u also can eat too. Is human salmon fish oil. One thing u have to take note is if u buy in pharmacy make sure is pure salmon fish oil because some salmon fish oil are with vitamin and is main for human so not suit for dog due to high vitamin. The salmon fish oil i bought in Aus is 500 cap about RM 90 plus. Cheap right. Buy some for your pug and is really good. 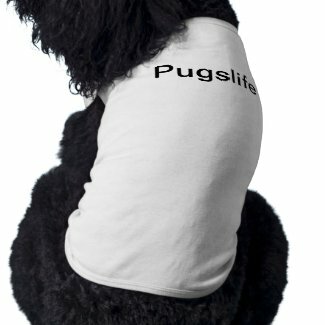 Mind to take some photo of your dog skin allergic and email to me. I need to see what kind of allergic? Your dog not demodex mange problem right. Try to get some good quality dog food like orejin brand but a bit expansive and give sometime because it won't get better very soon one.. Skin allergic need very long time to cure or control it won't let it worst. I also feed my two puppy with can food. Each i just give 1 spoon of can food mix with dry food. So 1 can food i can feed them for 1 week so it won't be too costly. My male pug are skin allergic after i bought him back two week and i have bring him to see vet few time and the vet give me the answser same ask your vet. My male skin problem is on and off got pimples on his whole body and is big like 5 cents in size. AFter that i found some information from internet so i try look for dry dog food ingredient are without grains such as corn, wheat, glutens, dairy or soy. All those thing are hard to digest food so it will cause sensitive dog got skin allergic. After i read this homepage than i try to get dry dog food are without corn, wheat, glutens, dairy or soy. And the brand i know without alll those ingredients are Innova, Eagle Pack Holistic Select, Nutriedge, California Natural, Natural Balance, Orejin. Orejin are most expansive dog food but is great A dog food. Now i feed my two pug in Innova brand. After i feed my male pug in Innova for 1 months plus and i found his skin problem are under control and the pimples are less and not as much as provious. Other is i found Interceptor are help for his skin problem too. Interceptor is a heartworm monthly pill and is same as heatguard. I give my pug in Interceptor because my male pug also allergic with heartguard so my vet intro this Interceptor to me but is more expansive than Heartguard. Hope u can understand my broken english and if u have any question just ask and i love to share what i know with u.